This fall, FECPL’s boat electrofisher is being used for various projects and courses. Below, Moumen Youssef provides an overview of electrofishing. 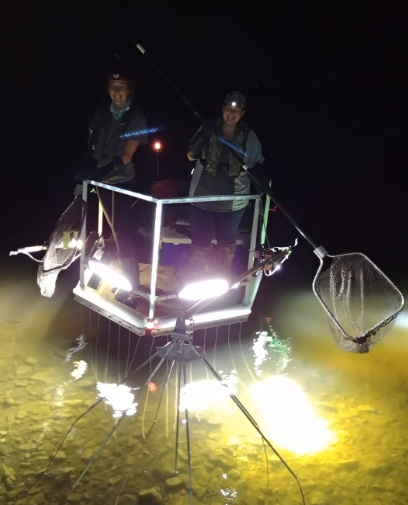 Electrofishing is used as a scientific survey method to sample fish populations and determine a variety of factors including the species health, abundance, and their density in an ecosystem. Biology, Environmental Science and Environmental Studies students at the Cooke Lab at Carleton University use this technique to capture and tag fish. Contrary to what someone may think, the practice of electrofishing does not cause significant harm to fish but rather stuns them temporarily giving the surveyor enough time to capture the targeted species. Other sampling techniques such as trap netting may cause fish to be held for up to 24 hours, can often lead to injuries to the captured fish and/or even predation from other fish that are captured in the net. Electrofishing relies on two electrodes which deliver a current at a set voltage from an anode to a cathode through the water. This current creates an electric field around the unit being powered and causes fish to be attracted more closely to the stronger current, making them swim towards the unit being powered (think of a weak magnet). The affected fish would typically turn belly up and would be stunned for a few seconds or minutes, depending on the size and the type of fish species. The two most common types of electrofishing involve either a backpack or boat. Backpack electrofishing is better suited for smaller streams, typically where boats would not enter. Boat electrofishing would take place in larger streams or rivers closer to the shoreline or shallower waters. This is done so that the netters have better visibility through the water and can see the species they are targeting. A list of safety procedures and practices must be followed when using either type of electrofishing.